Q: We’ve decided to shut down the pond this winter. Do we just need to take out the pump and filter? A: Oh, if it were only that easy. Even though you plan to shut down the pond for the season, you still need to complete some winterizing chores. Put on your Aqua Gloves and hip waders. Here is your step-by-step guide for closing down shop and storing pond equipment for the winter. Do you have a leaf-collecting net covering your pond? Once the colorful foliage has stopped falling, remove the net, shake off the leaves and store it until next fall. If you leave it on the pond, heavy snowfall and ice could collect on it and weigh it down—possibly endangering your fish. Then grab your gear for cleanup. Next, protect your pumps, filters and hardware from the freezing temperatures. Disconnect the plumbing and drain the water from the tubing to prevent them from freezing, expanding and cracking. If your filtration system has built-in ultraviolet filter or if you have a UV clarifier, disconnect it and take it indoors to prevent ice damage. Remove your pump and store it in a bucket of water to keep the seals moist so they don’t dry out and crack. And lower your water level below the opening of skimmers to protect it from expanding and cracking during freezing temperatures. Natural bacteria that have been thriving in your pond will become dormant and die through the winter, so you can remove your filter media and store it indoors for safe keeping. Be sure to wash the pads or BioBalls with a strong stream of water while they’re still wet; it’s much easier to clean UVs and media when they’re wet versus trying to scrub off dried debris in the spring. Do you have plants in your pond? Tropical varieties—like tropical lilies—must be removed and stored inside if you hope to keep them thriving until spring. Check out this blog post that details how to remove and store them. Hardy varieties can stay in the pond; take some time to trim away dead or dying foliage after the first frost. While you’re at it, pull out your pond vacuum or hand net and dig up as much detritus as possible. 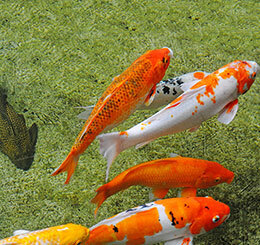 The less rotting debris in the pond, the more available oxygen for fish. Your fish will take a winter nap through the cold season, but they’ll still need oxygen to survive. If you live in an area that freezes, be sure to install a de-icer, aeration or both (as we feature in the PondAir & Thermo-Pond De-Icer Combo) to help maintain a hole in the ice. That will allow the toxic gases to vent and oxygen to enter while circulating the water. If you haven’t already switched to wheatgerm fish food, do so now. Our Spring and Fall Fish Food is easier for your finned pals to digest—which is what they need when temperatures start to fall. As the water reaches 40 to 50 degrees F, slow down and stop feeding them for winter. Remember that with no filtration system running, any waste they produce won’t be sufficiently removed. Finally, if temperatures still permit, continue to add natural bacteria designed for cooler temperatures, like Seasonal Defense. The little microbes will continue to break down organic waste that wasn’t easily cleaned from the pond. 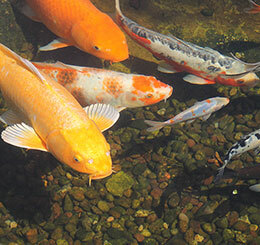 As you prepare to shut your pond down for the winter, take time to check off these chores. It’ll make next year’s spring pond season one to look forward to! For a more details or to watch a step-by-step video view our Learning Center. Pond Talk: Do you have a dedicated spot in your garage or basement for pond supplies and equipment?